Prizes were awarded to the float and marching group categories. 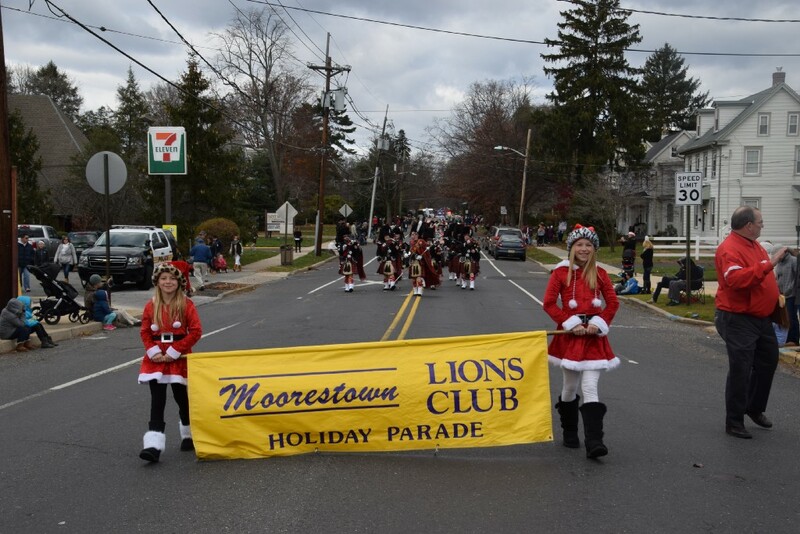 The Moorestown Lions Club’s 56th Annual Holiday Parade was held on Saturday, Dec. 3, on a sunny day in warm weather before a crowd of 5,000 people lined Main Street from Chester Avenue to Church Street. Moorestown Township Council Members along with Citizen of the Year, Jonathan E. Miller, MD, and the 2014, 2015 and 2016 New Jersey Senior Americas were led down the parade route by the MacGregor Pipe Band in full regalia. The parade consisted of 37 different marchers, floats, string and marching bands. The string bands were Aqua and Woodland, and the marching bands were Liberty, Burlington County School District and Moorestown High School. A stilt walker, barnyard animals including a llama and a multitude of fire trucks and emergency vehicles were included. Prizes were awarded to the float and marching group categories. Cub Scout Pack #61 won the float competition, Brownie Troop #27447 took second place and Cadette Girl Scout Troup #26174 and Junior Girl Scout Troop #25288 tied for third. Girl Scout Junior Troop #23618 won first place in the marching group category. Coming in second and third place in the marching group category were Girl Scout Troop #22342 and Girl Scout Troop #27407, respectively. The parade was held with the financial support of the Township, Burris Construction, Stines Apothecary, Lewis Funeral Home, E&B Company, Liberty Bell Bank, Mooretown Rotary Club, Happy Hippo Toys, Ralph’s Market, McDowell Posternock Law, Moorestown Eye Associates, Carl’s Shoes, Passariello’s, Turnkey Title, Neals Barbershop, The Evergreens, Bishop and Bishop C.P.A., South Jersey Eye Physicians, Armstrong Pediatric Dental, Merriken Financial Group, Workman Bike Center, Mauritzio Bistro, Moorestown Hardware, Remember Me, Signature Designs, Roeffler of Moorestown, Moorestown Taylors, La Di Dah and Tait Roofing. To view the winners in action, visit: https://m.facebook.com/moorestownlions/.